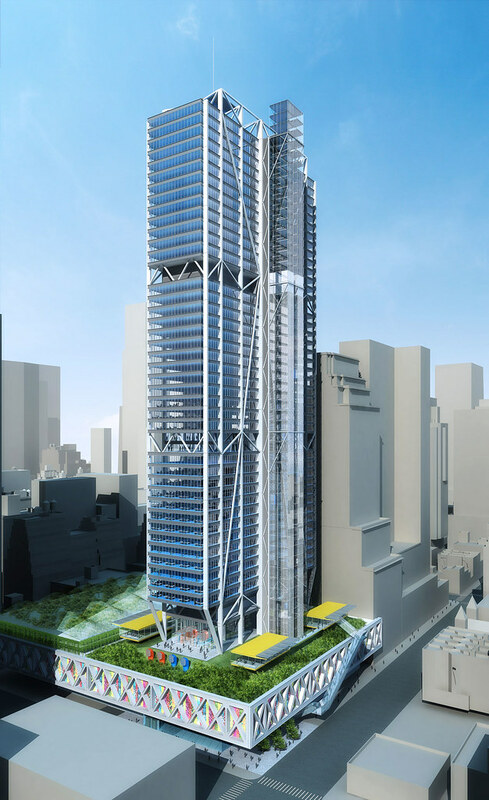 AJ got word two weeks ago that Rogers Stirk Harbour + Partners had been chosen to develop a new 42-story tower atop the Port Authority Bus Terminal in Midtown Manhattan. What our colleagues across the pond did not have was the new rendering released yesterday by the PA when it made the announcement official. Lord Rogers beat out KPF and Pelli Clarke Pelli, which had also been in the running for the commission. Notably, RSHP’s original presentation consisted simply of a model shot of the firm’s daring design, while the challengers proffered sexier (if more conventional) offerings. If this all sounds familiar, that’s because it is: Nine years ago, Vornado Realty Trust won the right to undertake the very same project, but then the dot-com bubble burst and the firm backed off. The PA tried to find another developer, but Vornado sued to retain its development rights. Only last year did the two sides come to a settlement, which basically picked up where they had left off. Hopefully, history won’t repeat itself.